This report compares the Troma version with the old German version. Both version can be found on the German DVD from Astro. The censored Troma version was released for example in the USA, Japan, Australia, and Great Britain. In the old German version there are only three plot scenes missing which won't be mentioned in this report. A completely uncut version can be found on the Dutch DVD. Jessica is being dragged over the table a bit longer. Several times, there are cuts to the widely opened bloody mouth of the old granny. The granny is chewing on Erika much longer. 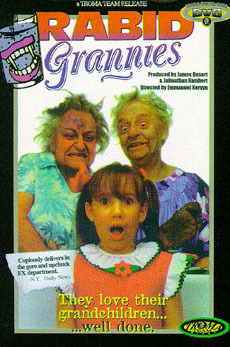 You can see a close-up of the granny's face while she has some flesh in her mouth. Cut to the beheaded body on the table, blood running out of it. The kitchen aid is lying on the floor. The camera move slowly upwards, from the hand with the glass shard in it - during this, she is twitching and groaning. She's able to slightly opening her eyes, but eventually dies. After the strike with the sword, blood is spattering from the granny's arm stumps. The granny puts her foot down a bit more and presses the woman against the fence. Another shot of the severed leg falling down the stairs and lying on the floor is missing (2 secs.). Instead, a two second shot of the stairs without the leg was inserted to maintain continuity of sound and picture. The beginning of the shot where a dog is feasting on the leg is missing, as well as the camera movement to the left and then slowly upwards, away from the severed child's leg. Some blood is spurting from the stumps of the woman's cut off fingers. A few frames of it can still be seen in the Troma version. The burnt face can be seen a second time. The granny is ripping some flesh out of the man's leg in two shots. The man gets his leg bitten off by the granny. There are alternating shots of the granny, the man screaming in panic, and Harvey. . The granny is licking the blood from her claws a bit longer. The granny's belly has popped open, intestines are falling out of it and she is laughing like crazy. Further, two shots of Harvey are missing. The granny is twitching a bit longer, laughing. The cut to the granny lying on the floor laughing is missing. Blood spurts from the arm stump. Harvey is screaming like crazy and gets his legs chopped off. A short cut to the granny on the floor. Now the weapon (an old knight's ax or something like that) gets rammed into his genitalia and he is lifted up. Another cut to the granny lying on the floor. You can see him in the air for a short instant. Harvey is lying on the floor next to something gory. Harvey's death lasts longer. He sort of grabs into the air and groans while the survivors which are left are watching, shocked. The granny sits up, followed by a shot of the butler. The camera moves closer to his face. The granny eats some guts. Brains are spattering on the wall. Brains are sliding down the wall. A shot of Blood spurting on the street and the camera moving upwards to the severed arm are missing. After the end credits, there is a somewhat longer black screen in the Troma version whereas in the old German version, there is an 'Astro' logo.